Anthony Joshua could face Joseph Parker in a heavyweight unification bout in Cardiff as early as March 2018. Promoter Eddie Hearn says a deal is close for a bout between WBA and IBF champion Joshua and WBO holder Parker. Cardiff's Principality Stadium is a possible venue after Joshua beat Carlos Takam there in October. "Joshua's aim is to become undisputed heavyweight champion of the world and to do that he has to beat Joseph Parker and Deontay Wilder," said Hearn. "The Wilder fight is in dreamland at the moment because of his demands, but the Parker fight is very close." Hearn told Sky Sports he expects to have to "overpay" 25-year-old New Zealander Parker to face Joshua. "Ultimately we're going to have to because if you want to fight Anthony Joshua these guys want to be overpaid," he added. "He's the Willy Wonka golden ticket fight everybody wants and unfortunately for him it means sometimes taking a deal that isn't right. "We're not just going to fold over - but we understand we're going to have to overpay Josie Parker to get that unification fight - we need these belts. "There's no secret and they know that as well." WBC belt holder Wilder is reported to want a 50-50 split of the purse to fight Joshua. 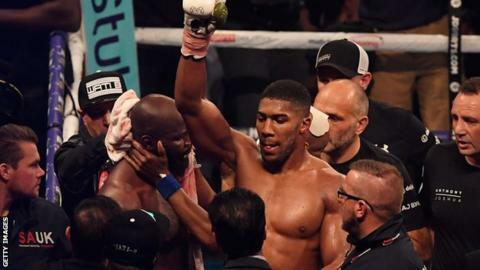 A crowd of 78,000 saw Joshua stop Takam in the 10th round in Cardiff. The Principality Stadium - formerly known as Millennium Stadium - has a roof which Hearn says makes it the safest option for big fights in the winter months. "The original plan was to go to the 02 in March, but against Parker for a unification fight that won't be the case - Millennium Stadium is an option as well," said Hearn. "We're looking at all kinds of different venues. But by the end of 2017 we have to be in the position where that deal for that fight is done."